Designed by Sydney Camm as a potential successor to the RAF's ageing Siskin fighter, the Hawfinch was built to Specification F.9/26, being one of nine contenders for RAF orders. Constructed in 1927 as a private venture, it was entered in the F9/26 competition at Martlesham Heath against the officially sponsored Annstrong Whitworth Starling, Boulton-Paul Partridge, Gloster Goldfinch and Hawker Hawfinch. 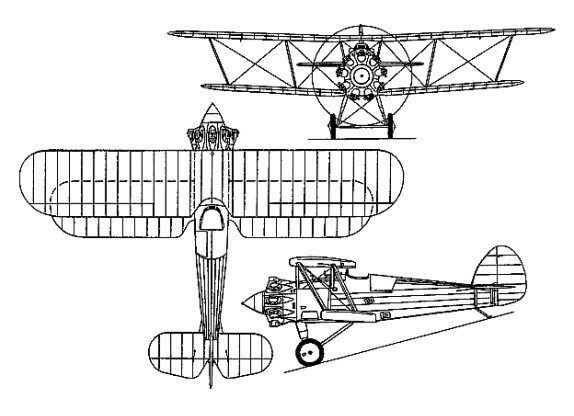 Flown for the the first time in March 1927, the Hawfinch was of fabric-skinned metal construction, with an armament of twin synchronised 7.7mm Vickers guns and powered by a supercharged nine-cylinder Bristol Jupiter VII radial of 450hp (which replaced a Jupiter VI shortly after the commencement of flight testing). Because of the closeness of the competition between the Bulldog and the Hawfinch the British Government ordered a single Bulldog II for further trials. The Bulldog II had a longer rear fuselage to overcome the spin deficiency of the prototype. First flown on January 21, 1928, the Bulldog II was tested against the Hawfinch at Martlesham, but the competition proved so close that a final decision was reserved until service pilots could assess both types. Eventually the decision was based on the ease of maintenance and here the Bulldog, with its single-bay wings as against the twin-bay wings of the Hawfinch, won. The Hawfinch prototype subsequently participated in various experimental programmes, during one of which the original two-bay wing cellules was replaced with single-bay cellules, other tests being conducted with a twin-float undercarriage.